During the First World War, thousands of wounded soldiers were returned to Britain for hospital treatment and convalescence. They were taken to existing military hospitals but soon, with the numbers of casualties increasing, more accommodation was required. Large public and private buildings, such as workhouses, schools and country houses were turned into hospitals. This resource reveals the wartime stories of three buildings that temporarily became hospitals. Battle Hospital in Reading treated casualties who had recently been transported back to Britain, while two country houses in Yorkshire, Temple Newsam House and Lotherton Hall, admitted convalescent soldiers. Until the outbreak of the First World War, Battle Hospital was a workhouse. Before the State provided free medical treatment or unemployment benefits, people who could not support themselves had to go and live in the workhouse to receive help. When the war began, Reading workhouse was quickly renamed ‘No. 1 War Hospital’. 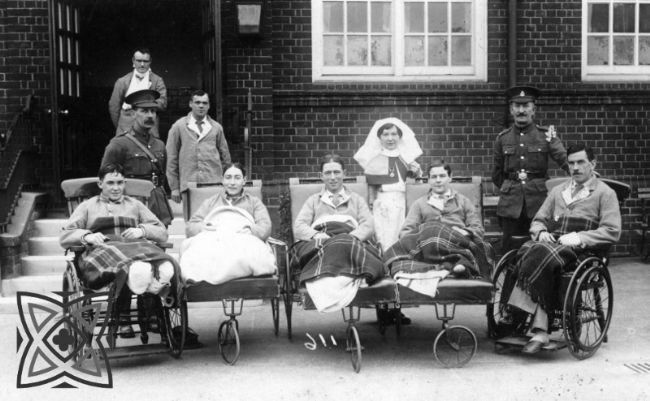 Reading became one of the main medical centres in Britain, housing over 2,500 casualties by the end of the war. A Hospital Depot producing specialised equipment such as artificial limbs was also opened in the town. Many of the nurses were volunteers. They cared for the casualties but also tried to raise their morale by arranging day trips along the river and producing a hospital magazine called The Ration, which was filled with articles, cartoons and sports news. In 1919 the work of the medical staff at the hospital was rewarded when they were included in the Reading victory parade alongside the soldiers. It had been recognised that the doctors and nurses had played a vital role during the war.